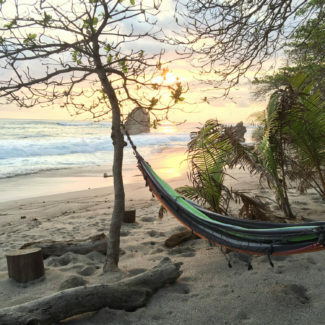 Last week, my sister and I went on a road trip through Costa Rica. Kelly happened upon round trip flights from JFK to Liberia, Costa Rica for $192, and I happen to love Costa Rica. 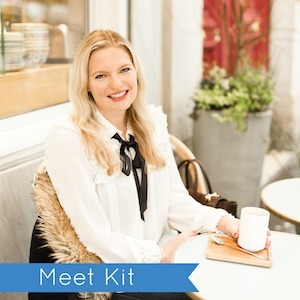 I booked a $38 flight on United to get to New York, and the next day Kelly and I departed for Costa Rica. 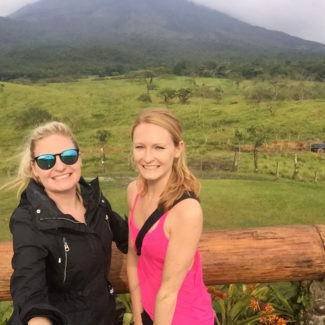 We decided to split our vacation into two parts, adventure in La Fortuna by the Arenal Volcano followed by relation on the beach. 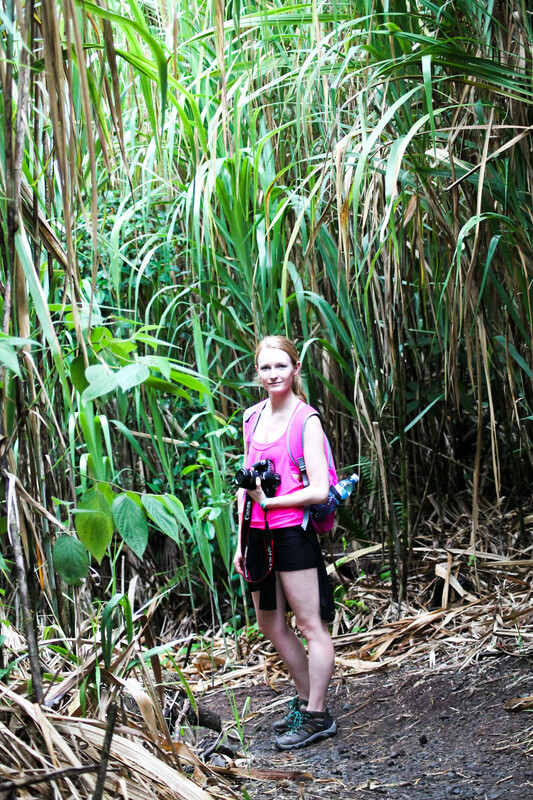 Today I am going to tell you all about our time in La Fortuna. Once our flight landed we rented a car and drove 3 hours to our hotel. 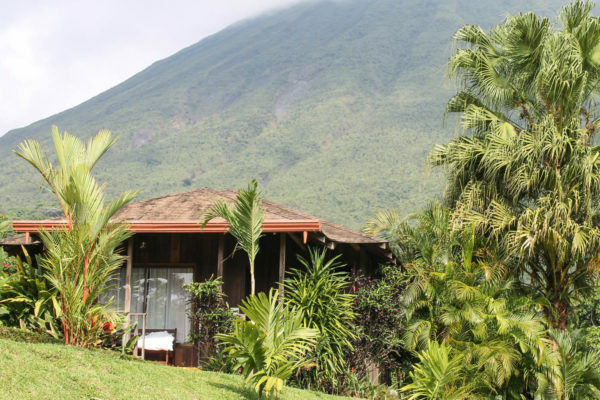 The accommodations in the La Fortuna area are certainly rustic, but also very affordable. 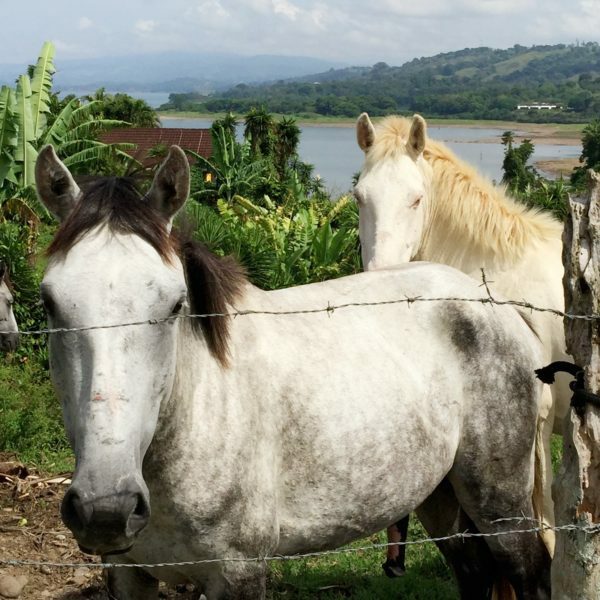 The drive to La Fortuna was very pretty – we passed lots of farms with horses and cows and lush green forest. 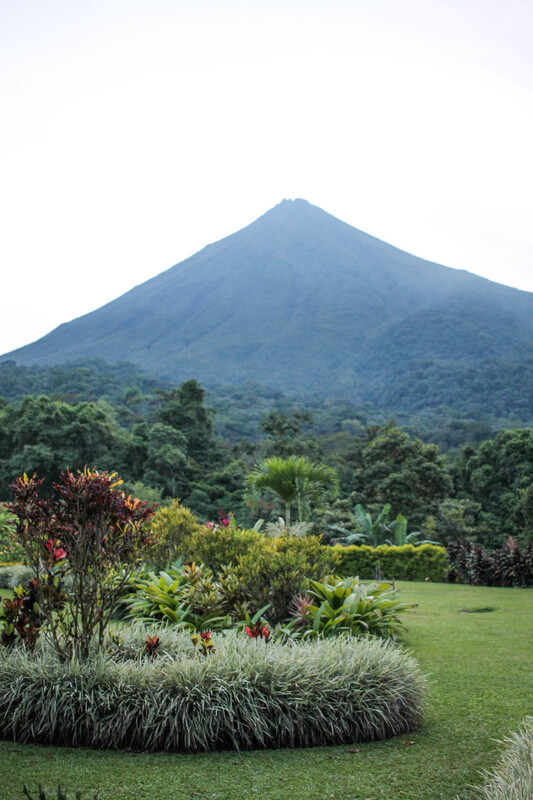 We stayed a Lomas del Volcan and loved the eco-friendly accommodations boasting views of the volcano. Rates were only $100 per night for a casita, a small house with a back deck. Breakfast was served in the open air hotel restaurant overlooking the base of the volcano were we could watch birds snack on fruit. 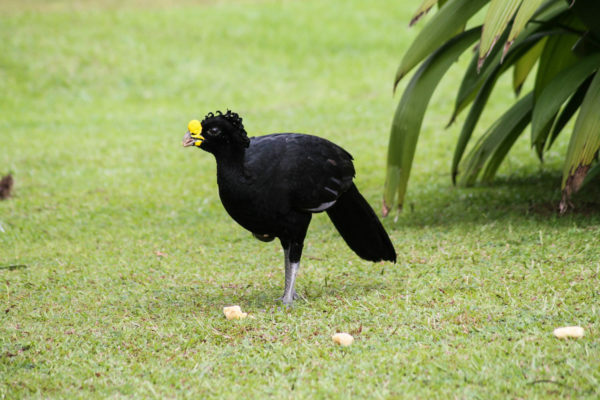 One morning we saw a large bird called a Great Curassow, a special sight since they are a rare species. 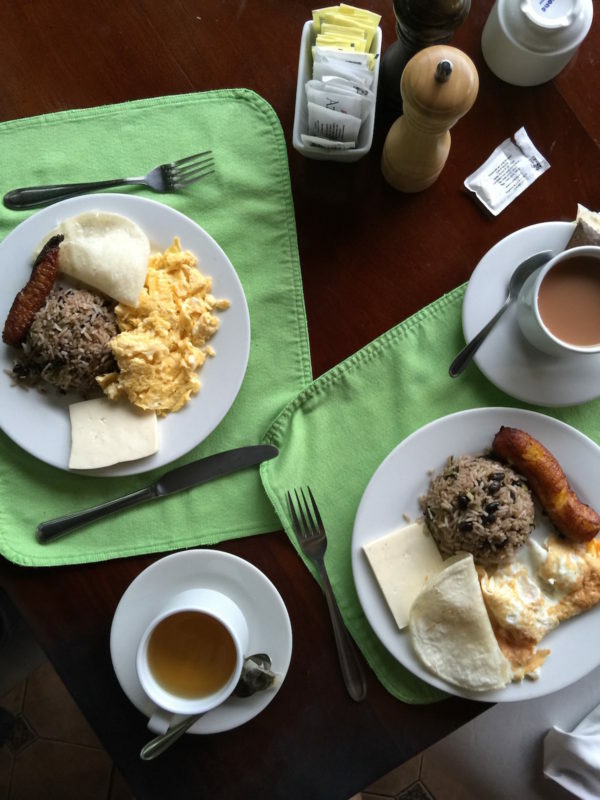 We loved the homemade breakfasts at Lomas del Volcan, which were included in our room rate. 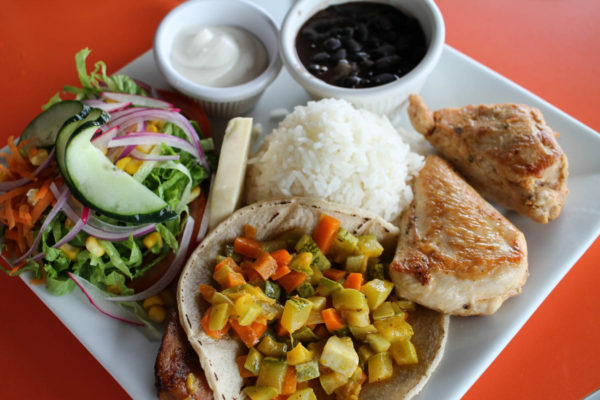 We ate the typical Costa Rican breakfast, gallo pinto – eggs, rice and beans, tortilla, farmer’s cheese, and a fried plantain. It was the perfect fuel for busy days of exploring. The hotel also had a lovely pool area and hot tub, and a dip in the water was a nice way to relax and cool down after a hike. 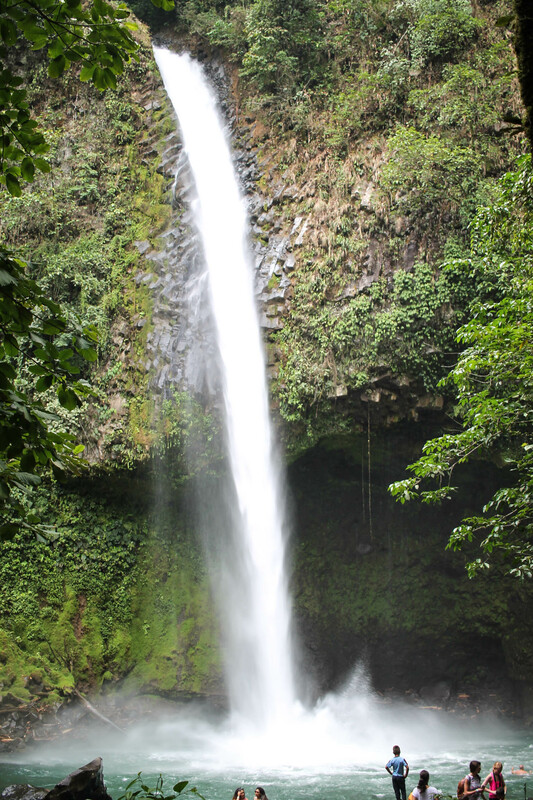 La Fortuna is the hub of adventure activities. 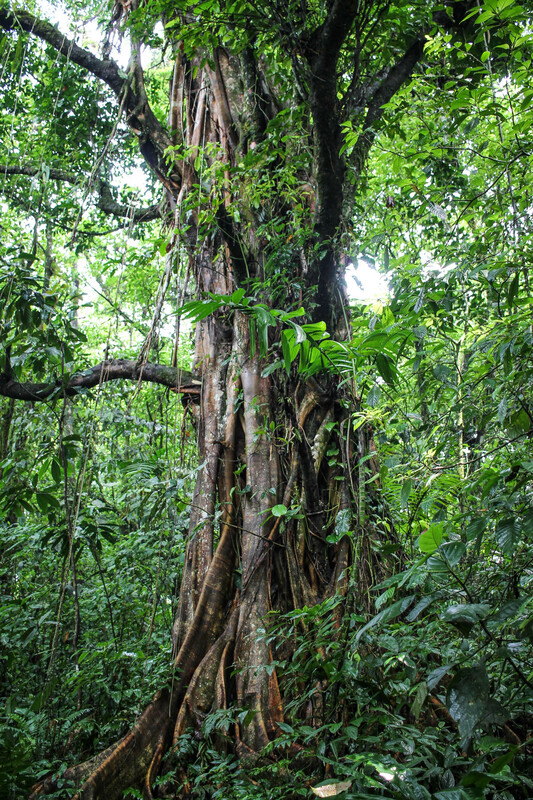 Sky Adventures is the big adventure tour company in Costa Rica, with locations in both La Fortuna and Monteverde (a town on the other side of the volcano). 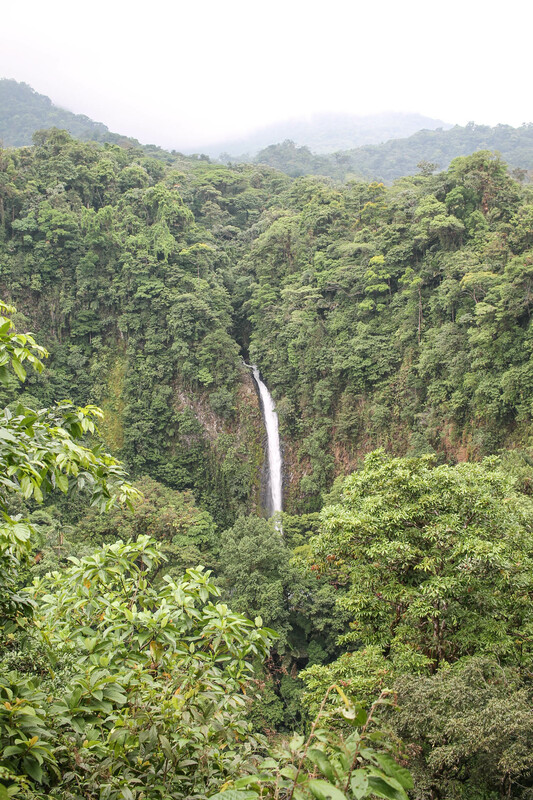 While I think kids would love Costa Rica, many activities have minimum height requirements that you should look into first. 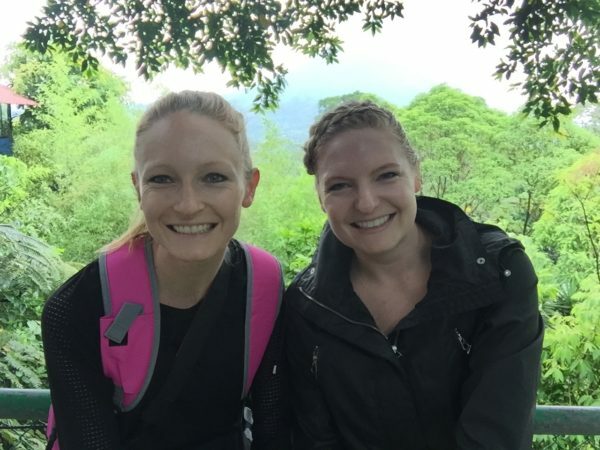 Even the more low key activities, like hiking, can be strenuous and involve hills and stairs. 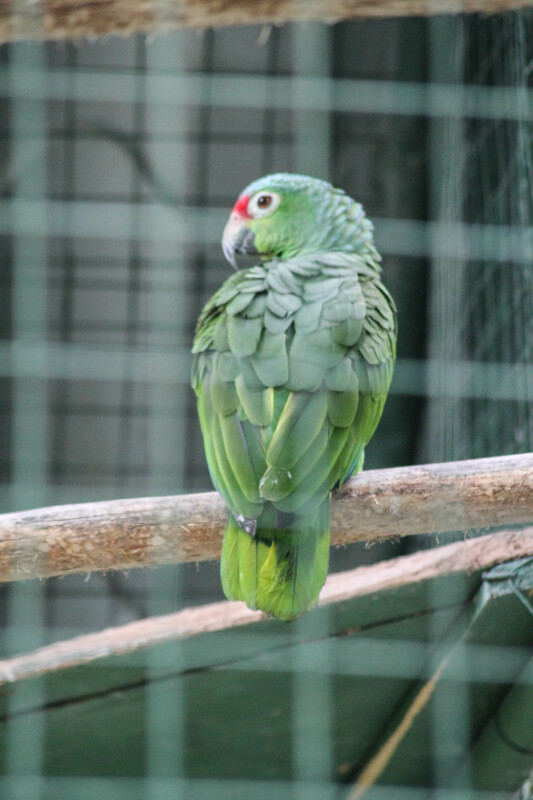 When I was in Costa Rica 8 years ago I went repelling down waterfalls, zip lining, and bird watching. This time Kelly and I wanted to partake in some more leisurely activities. 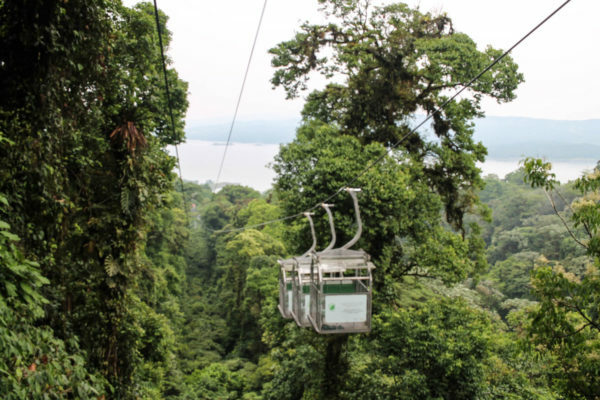 We started with a trip to the Sky Tram paired with a hike on the hanging bridges, both accessible from Sky Adventures station in the La Fortuna jungle. 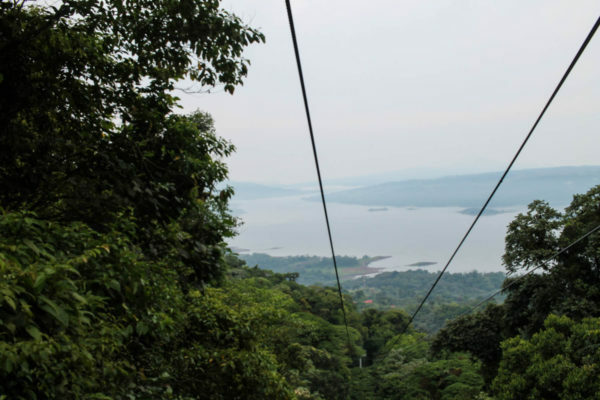 The Sky Tram offers wonderful views of the lake and volcano. It’s about 10 minutes each way on the tram, and there is a platform area where you can take photos before you go back the other way. After the tram ride, we grabbed lunch at restaurant on site. Then we went on a 3 mile hike to the hanging bridges. We loved this hike. 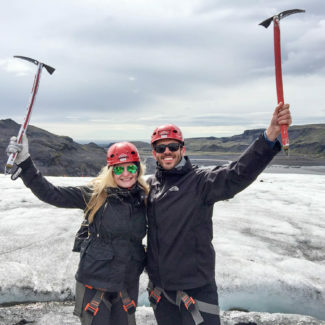 You have the option to do a tour with a guide, or to hike on your own. The hike takes 2 ½ – 3 hours and is a bit strenuous at times. It got a little hot since we were hiking from 12:30-2:30, but the shade kept us cool. 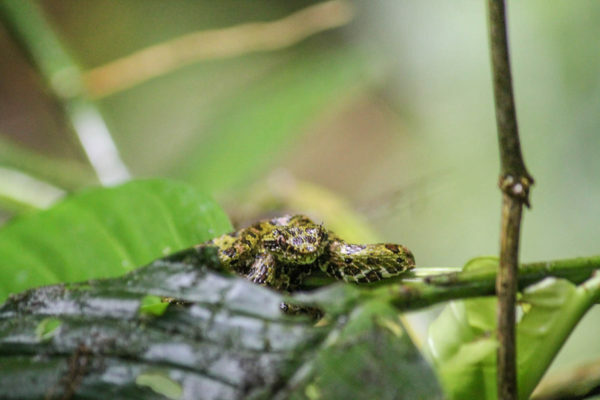 If you want to the full hike – go with a guide, he picked out wildlife that we would have never seen without him, like this little snake – which is poisonous. 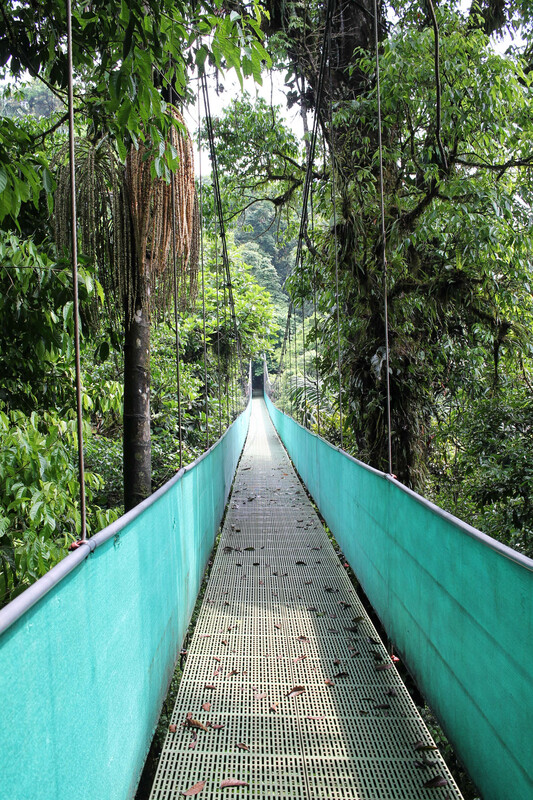 If you don’t want to do the full hike, you can just walk across a couple of the hanging bridges – this would only take about 30 minutes and is worth doing if you are at Sky Adventures. That evening we went to the Baldi hot springs. There are several different hot springs in La Fortuna. Some are touristy than others. Baldi is definitely on the touristy side of things, but we loved it. Kelly is very picky and wanted very hot hot springs, so the 104 degree water at the natural hot springs wouldn’t cut it. Baldi has 25 pools all at different temperatures. Some have bars, one shows sports, and one has a water slide. We paid $33 for entrance, and had a blast. It was also a nice way to relax our muscles after lots of walking. The next day we went to the waterfall. It’s part of a national park and entrance is $12. The path to the waterfall is well maintained, but it’s the equivalent of about 15 flights of stairs (according to the iPhone health app). 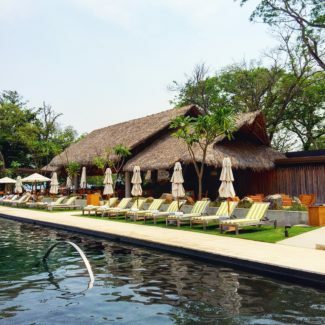 You can swim in the water, which is slightly cool and refreshing. I would definitely recommend wearing water shoes or sneakers that you don’t mind getting wet since it is a rocky walk to the water. 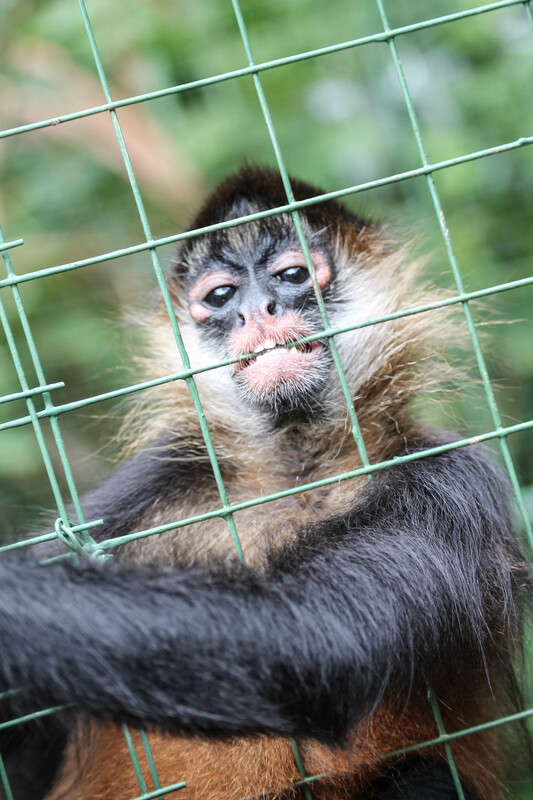 Then we drove to a animal sanctuary where we saw birds and monkeys. 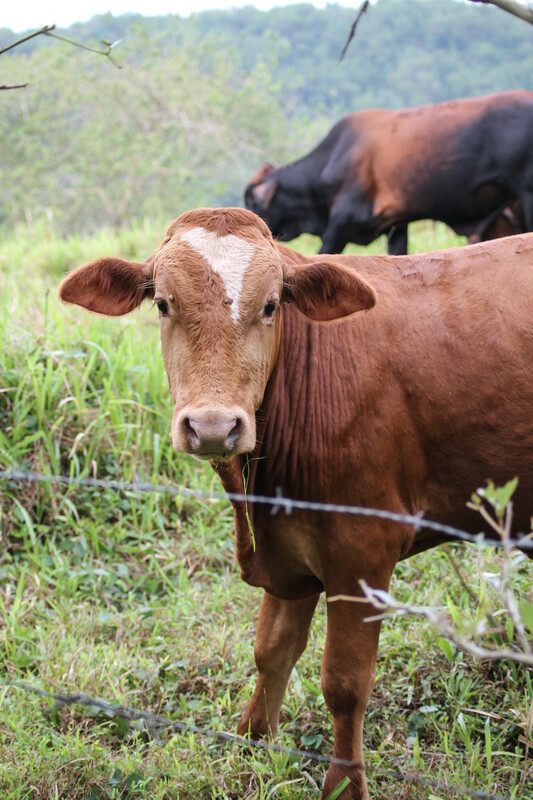 We had a tough time finding the place, but we had the chance to see animals up close. 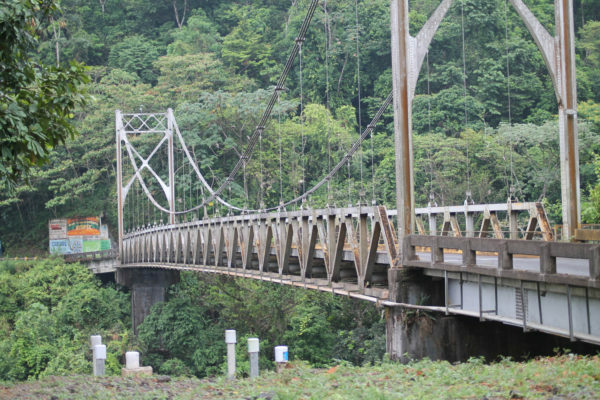 But driving over this bridge was a highlight of the 40 minute drive. 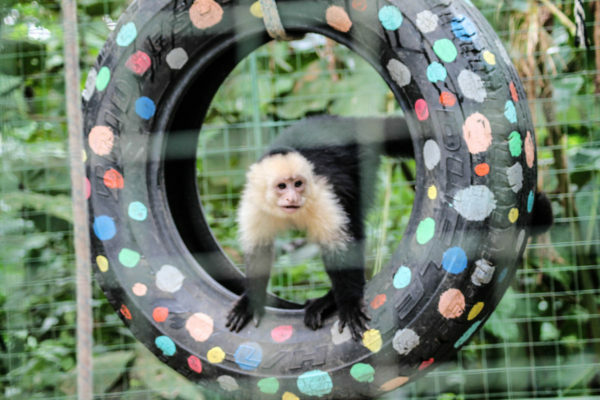 The sanctuary’s goal is to return animals to the wild if they are capable of surviving, so the animals at sanctuary always change. 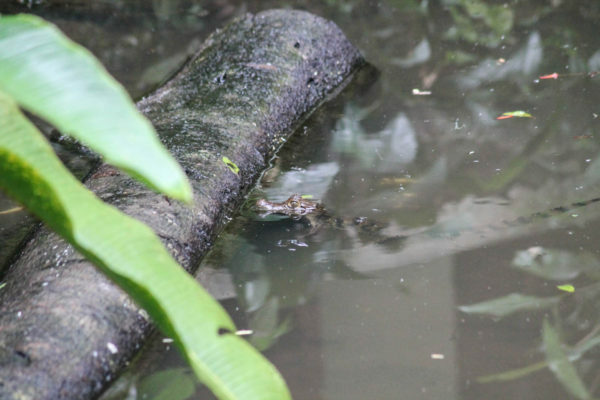 This baby cayman lived in the pond at the sanctuary. We ended the day with a hike through the old lava flows at the volcano. Hilariously, the staff at this national park had us park our car facing exit so that we could escape more quickly if the volcano erupted. 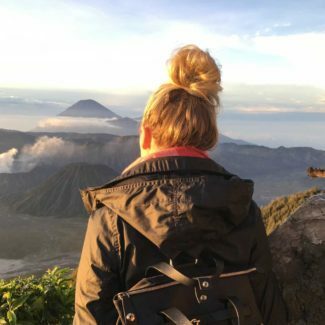 You can hike on your own, or with a guide, regardless, just make sure you have plenty of time to complete your hike before the sun sets around 5:30. These cows live on the land and we saw them at the start of our hike, and heard them loudly moo-ing throughout the hike (we were glad we saw the cows – the sound might have been confusing or frightening otherwise). 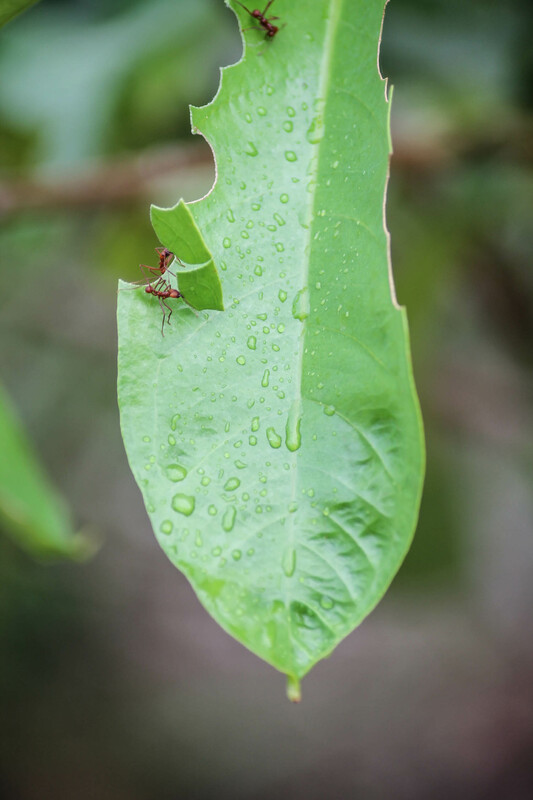 We saw lots of these leaf cutter ants on the hike. They carry pieces of leaves back to their ant colony where they become food for the fungi that the ants eat. 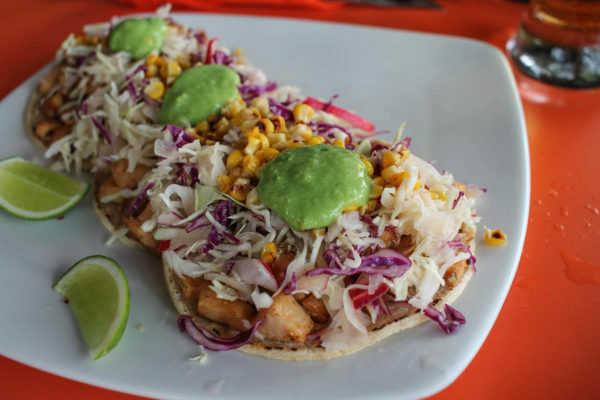 That evening we ate at Garra-Pata, a roadside barbecue place with the best food we had in La Fortuna. Kelly had a smoked pork ribs with smoked plantain with tortilla and salad. I had a steak with rice, beans, and plantains. It only cost about $25 total including beers. Throughout the vacation we took lots of snapchats which I have compiled into this video diary of our trip. Here are some notes on the video: that smoothie was nasty – it had ground up watermelon seeds in it, we never saw a sloth, and Kelly freaked out when a butterfly touched her and she couldn’t tell what it was. We ended the day with wine in the hot tub before driving 3 hours to the beach the next day. I will be talking about our time on the beach next week. 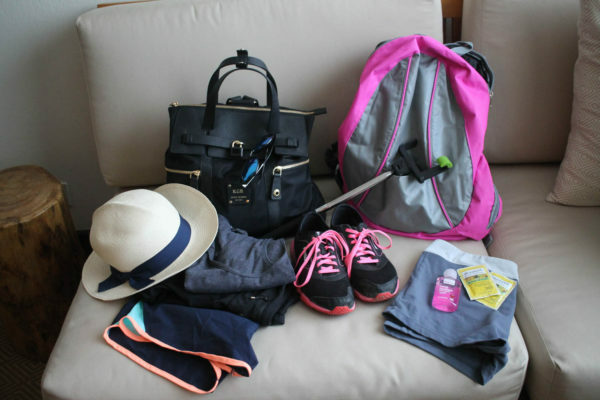 Wondering what to pack? Sneaks, sports shorts, sunglasses, hand sanitizer and wipes, hats, backpacks, and a selfie stick were our essentials for this leg of the trip.